The buzz that surrounded the sudden emergence of German dance group Milli Vanilli back in the late 80s was huge. Fab Morvan and Rob Pilatus, the faces (notice I didn't say lead singers) behind Milli Vanilli took the dance floors by storm when they dropped an album out of nowhere that spawned a number of hits, massive international sales, numerous American Music Awards and a Grammy for Best New Artist in 1990. 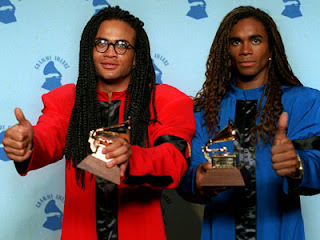 For a couple of guys who just won a Grammy - they don't look too thrilled. Then it all imploded when it was revealed that they didn't actually have anything to do with the creation of the album nor did they sing a single note on any of the songs either in the studio or live. When producer Frank Farian put the project together, the original group lacked what he felt was a marketable image so he found Rob and Fab to front the group in videos not realizing the huge success that would come and the demand for live performances that followed. During a "concert", their equipment failed which revealed they had been lip synching the whole time and their critics pounced on the issue and escalated it to the point where their Grammys were revoked and their record label not only dumped them but deleted the album and the masters from their catalog forcing the album out of print. They attempted a few comebacks with them actually singing but they never achieved the same success. On the eve of the release of their final attempt at a comeback album that used the original Milli Vanilli singers as backup, Rob Pilatus was found dead in a hotel room as a result of a drug overdose. A problem he picked up after the scandal broke. Fab went on to be a radio DJ and even released a solo album but never achieved the same level of success or fame. Interesting note - Frank Farian, the producer that was responsible for the whole mess has over 800 gold records and is responsible for some very successful German dance acts like La Bouche and Le Click as well as No Mercy and produced a Meatloaf album. He was also the guy behind the success of Boney M in the 80s. The video may not prove they couldn't sing, but they sure couldn't dance either! Dude - don't start with Boney M now. 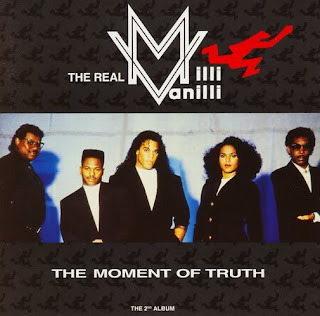 As for Milli Vanilli, they're very similar to what happened in baseball with the steroids... certain folks got caught and crucified for it, but all of them do it. Look at Ashlee Simpson on SNL? She received backlash, but she's still in the business. Its sad what happened to these guys for they were made the poster boys for "cheating" in the record industry. However, look at many of the major acts nowadays using the Autotune devices... what do we do with them?